As much as I love an interesting dessert, or a buttery breakfast baked good, usually when I am scouring the internet for recipes, I am looking for dinner. After all, it is technically possible to go a day without dessert (well not for me, but for some people); but most everyone would agree that at least one meal is a necessity. 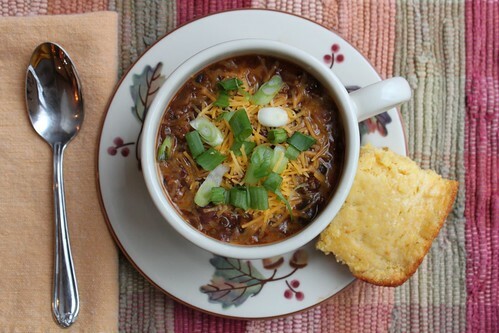 So while classic chili might not be the most exciting thing ever posted here, I can say that this is a tried and true recipe that will keep you warm on a wintery night. This is a real crowd pleaser, and my mom even requested that we make it as her birthday meal. Personally, I would’ve gone with the Lobster and Corn Chowder, but I guess that’s why it’s her birthday ;-). For the longest time I only liked turkey chili, but I’ve found that extra lean beef actually has the same amount of fat as turkey, with the added benefits of a healthy dose of iron and a lot more flavor. Be careful though, because using anything less than 90/10 will give you that greasy chili that I personally think is gross. (I prefer my fats disguised in baked goods, not floating on top of my soup). 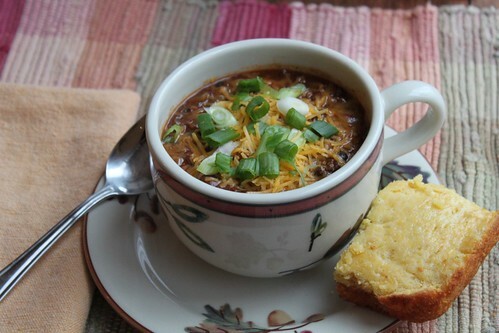 This chili is not particularly spicy, but can easily be toned down or up with the addition of extra jalepenos or crushed red pepper. Similar to the Cincinnati Chili, this recipe uses bittersweet chocolate, which really adds a dimension of flavor so don’t leave it out. Brown the beef in a large Dutch oven set over medium heat. Drain off fat if necessary. Add the onions, garlic and jalapeños and continue cooking for about 5 minutes, until starting to soften. Add the chili powder and cumin and cook until fragrant, about 1 minute. Stir in the tomato sauce and beer (or water) and increase heat to bring the mixture to a boil. Once boiling, reduce heat to medium-low and cover. Simmer for 10 minutes. While the beef mixture is cooking, place one can of beans in a medium bowl and mash with a fork. Stir the remaining two cans of beans, along with the mashed beans, into the chili and return to a simmer. Cook for 15 to 20 minutes. Remove from heat and stir in salt, cilantro and chocolate. Continue stirring until the chocolate has melted. Taste and adjust seasoning as needed. Serve with desired toppings. Looking on a the positive side of things, I will have to say that one of the best things in the past month has been able to see a lot of my mom and brother – 2 of the most special people in this world. I know my mom thinks she’s imposing, but I seriously love it when they are here. It basically makes it feel like a vacation, because usually when we are all together – it is a vacation. Of course having “house guests” also makes me like a grown up, which is really just like “playing house”- with a slightly more sophisticated (and dangerous) fisher price set. Because I really wanted to impress them with my domestic skills, I carefully planned a few things to make when they came. 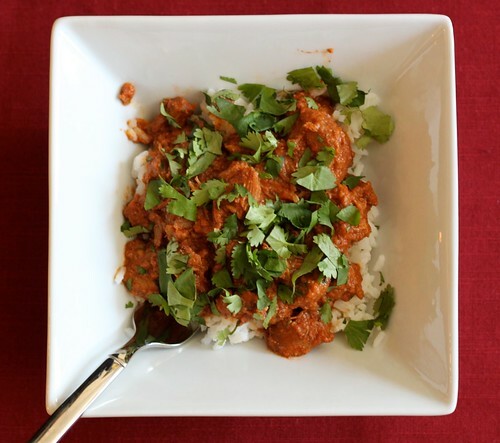 One of them was an old favorite, stuffed green pepper soup, and the other was this Chicken Tikka Masala. I’m pretty sure they will be coming back again soon :-). 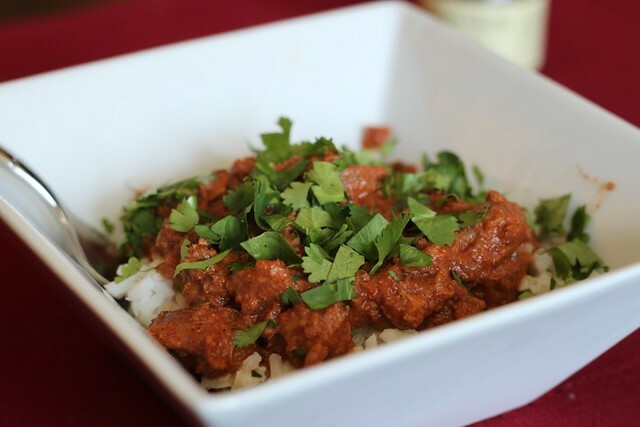 My mom, who claims to not really like curry, couldn’t stop raving about how deep the flavors are in this dish, and my brother stated that it was the best chicken tikka masala he had ever had (even better than some posh Asheville Indian restaurant he loves). I purposely waited a while to post this, because I wanted to see how the leftovers would be after freezing them for a while – and I can now safely say that they are still delicious. I froze the chicken, then thawed it and reheated it, adding just a little bit more milk and John and I still loved it! I would recommend making the whole batch, even if you don’t think you’ll be able to finish it all, because the frozen leftovers really are convenient. Please don’t be intimidated by the seemingly long ingredient list, it is actually a really simple dinner and there is very little prep work. I chose to brown the meat first because it tends to add a depth of flavor, but if you don’t want to dirty another pan feel free to simply put all the ingredients in the crockpot without pre-browning. 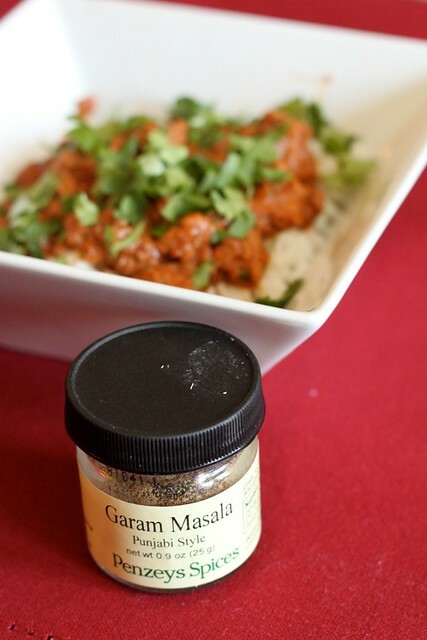 I was also really excited to finally use the Garam Masala I had bought way back when from Penzey’s. If you don’t have a Penzey’s nearby, I noticed when I was home at Christmas that even local grocery stores carry this spice. Having never used it before, I was a little worried about using a full 3 tablespoons of it. But never fear – it’s not nearly as strong as you might think and the dish was seasoned perfectly. My last pre-recipe suggestion would be to adjust the cream in this recipe for your liking. The original called for 1 1/2 cups of heavy (whipping) cream. That seemed like an awful lot, so I dialed it down and added some more greek yogurt at the end. Feel free to play with it a bit to get it the creaminess you would like. 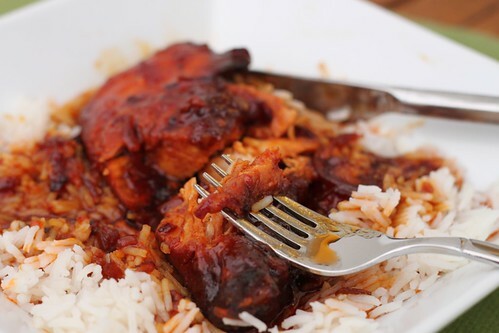 1) Cut the boneless, skinless chicken thighs into 1- 1 1/2 inch pieces. Sprinkle the coriander, cumin and salt over the chicken. Stir in yogurt to evenly coat the chicken. Cover and let sit 10 minutes or refrigerate for several hours. 2) Melt 1 tablespoon the butter in a large saute pan over medium heat. Raise the heat to medium high and brown about 1/2 of the chicken. . Transfer browned chicken to the slow cooker as it is finished. Then repeat with 1 more tablespoon of butter and remaining chicken. Throw the pierced jalapeno in on top of the chicken. 3) To make the sauce return pan to medium and 3 T. of butter over medium heat. Add onion, garlic, salt and stir. Cook until onions begin to brown, stirring frequently. 4) Add the 3 T. of garam masala and ginger and cook until fragrant (30 seconds), then raise heat to high and add crushed tomatoes and sugar. Scrap the bottom of the pan as you stir and bring to a boil. Then pour over chicken in slow cooker. 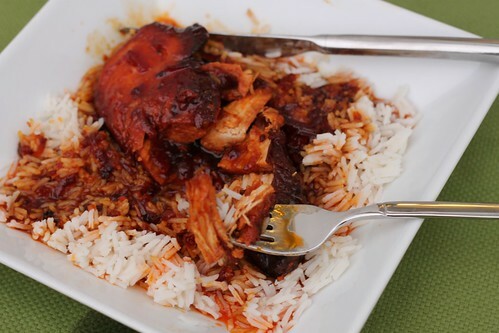 5) Cook chicken on low for 5 hours. 6) Mix heavy cream and greek yogurt into mixture, adding cream until you get your desired color. Heat for 1o minutes more. Adapted from Tasty Kitchen Blog c/o Eat. Live. Run. Welp, it’s happened. The first recipe on the blog made almost entirely by John. I don’t mean to belittle his cooking talents, but I think the fact that I trusted him with making this dinner should tell you something about it’s complexity. I had set the ingredients (all 3 of them ) out on the counter the night before, and planned on throwing them in the crock pot before I left for school, but as I mentioned last time, normally I barely get 2 of the same shoes while I’m running out the door, let alone make dinner 8 hours early. Despite my best intentions, if I wake up a few minutes early, then I simply diddle-daddle around longer until I am once again rushed to leave. So John was nice enough to make this for me in the morning. While this is certainly not a complicated or gourmet cooking dish, it is definitely something worth keeping in your recipe arsenal. Also, I should mention that there is really nothing “French” at all about this, other than the fact that it uses American’s version of “French Dressing”. Nevertheless, this dinner is delicious and I had trouble saving my second piece of chicken for lunch the next day. I found myself eating every last piece rice that the scrumptious sauce had touched. Plus, its so easy you really have no excuse not to make it – it’s 3 ingredients that you put into a pot. You can adjust the cooking time to fit your schedule so it’s ready when you get home. For example, Nikki mentioned that you could use 6 frozen chicken breasts and cook it on high for 4 hours and low for 2 hours, or use 4 fresh chicken breasts and cook it on high for 3 hours. Since I think one of the best things about crock pots is coming home to them being ready, I prefer to cook things for a longer period of time on low, which I have indicated below. I think next time I am going to at least 1.5 the recipe because this really made great lunch leftovers (especially when compared to the hospital cafeteria). Place all ingredients in the crock pot and cook on low for a minimum of 7 hours, but longer is fine. Serve over rice.